In a perfect world, a band like Little Caesar wouldn’t need an introduction: their blend of sleaze rock, blues and soul would have topped the charts in the early 90’s, and we would now be referring to a household name. However, twenty-eight years after their self-titled debut, they haven’t reached the commercial potential that their sound hinted at. Having fallen trap of the usual pitfalls in the music business – bad management, producer ego trips, fashion trends and wrong distribution – they had no choice but to end their first installment in 1992. Battered, bruised but with a new sense of purpose, these L.A. based rockers resumed their career in 2001, and since then several albums were released, including a live offering called Brutally Honest Live from Holland, which sounds as raw and straightforward as the name suggests. With a lineup that is finally stable, they are back with their eighth studio album, simply entitled Eight. 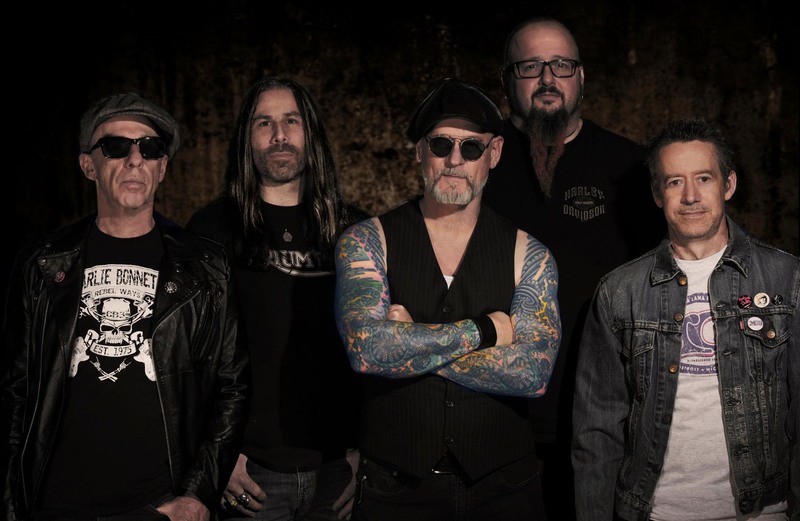 Rodrigo Altaf spoke with their singer Ron Young, and discussed a few tracks on the album, the band’s current plans, and their trajectory through the years. Ron, congratulations on the new release! Six years after “American Dream”, Little Caesar is back with album number eight, simply titled “Eight”. 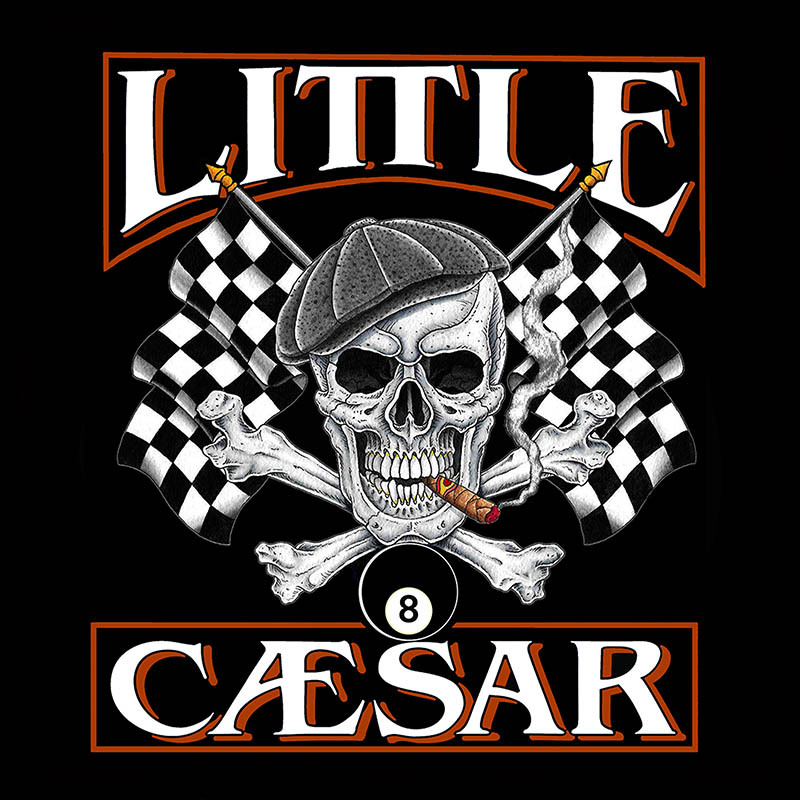 It seems a great time for bands like Little Caesar who plays the blend of blues no-frills rock and roll and soul like yours to release a new album, right? Yeah we just we just keep doing our same thing and try to get better at it. We play what we like, and we’re having a great time. It’s great to have a new album out for sure! Usually, it’s a riff or a chord change that then inspires a melody and I write 90% of the lyrics and try to use words as a percussive thing, use a phrasing that has a swing to it against the melodies or the rhythms we came up with. So words are almost always the last thing. The album kicks off with “21 again”. Is that based on your personal reflection or is that a fictional story? Well, …it’s kind of half-truths man…(laughs)! You know, as you get older and you start having like surgeries and medical conditions you long for energy and flexibility, but you also wish you kept the wisdom of our older age so you don’t make the mistakes. So that would be somewhat the idea of where that came from. I just realized the other day that the second song “Mamma Tried” is a Merle Haggard cover. You guys certainly added some heaviness to the original. How did you choose that cover? We always had an affinity for country music, because it gave birth to Southern Rock. A few years ago Merle Haggard died and I started listening to his discography – so many amazing songs! “Mama Tried” caught my attention because there are such great lyrics in it, and somehow I saw a great rock song there which was downplayed, and we tried to magnify it. Every review that I read was unanimous in pointing out a particular line in the album from the song “Vegas”: “Too stupid for New York, too ugly for Hollywood”. Where did that line come from? I try to write clever lyrics, especially as I get older. I just kind of thought that it was a perfect encapsulation of a lot of the current society especially with the Kardashians, and selfies, and all the self-indulgence and I just thought it was a perfect way of capturing the fact that so many people have problems finding their stardom, you know? ­Being a born and bred New Yorker and living in Los Angeles for so many years and then going out and meeting so many people I just saw there were so many people who wish they could thrive in either city but they don’t really have what it takes. I think that’s going to be the next single because everybody really likes the track so we’re shooting a video for it. Another number I was curious about is Crushed Velvet. What was that song about? There’s a lot of women we know in Los Angeles that used to be worshiped and the queen of the whole scene. And as they get older they’re kind of desperately clinging to their youth and being delusional as to how old they really are, and to what’s really going on. They still keep behaving and dressing like they’re the queen of the ball as if they were still 23 years old. And it’s kind of pathetic and kind of sad. So I just kind of painted this story about one particular woman that caught my interest and I wrote that song about her. The next song that caught my attention is the first single from the new album, “Time Enough for That”. I think you found a perfect formula for a ballad: it’s emotional, it’s catchy and melodic without being corny. And it’s also rooted in soul music in many ways right. I’ve always had an affinity for soul music as a kid, and as I started getting into rock, all my favorite singers had similar influences – you know, guys like Paul Rodgers, Rod Stewart, Steve Marriot – really soulful singers. So whenever we write a ballad, it’s always an opportunity to come up with classic soulful bluesy melodies and try to find lyrics that are kinda universal, that people can relate to because it’s not about party, it’s not about excess. So we try to find that opportunity to write thought-provoking lyrics. The Little Caesar lineup seems a bit more stable these days. What do you think contributed to that? We’ve had a problem finding the last guitar player. That’s the reason why I didn’t want to do a record until we found a perfect fit. I wanted it to be five really contributing members musically and songwriting and we had some really good guitar players over the years, but they were all busy doing other projects. When Mark Tremalgia came into the band, he had so many cool ideas and we got along so well, that we thought it was time for another record. Back in the late 80’s/early 90’s you seemed on the verge of breaking big, but for a number of reasons that never happened. What would you have done differently now if you could go back in time? What I would have done differently is not work with all those huge names. I wouldn’t have worked with Jim Iovine, John Kalodner or Bob Rock. The biggest problem the band had was their egos and them fighting amongst themselves over a billion other reasons than our music. We ended up being like children that get hurt the most when their parents fight (laughs). There were so many business things that were going on behind the scenes in ego battles between these huge personalities…and it trickled down to the band and it made our business suffer. They had all these great expectations, and all those egos involved, and the problem with very successful people is that as soon as there are problems, they tend to move on to the next best thing that looks easier. That’s kind of what happened to us. Now that you mentioned it, that was one of my follow up questions – working with John Kalodner, one of the biggest A&R guys in the music business, did you find that an opportunity to enhance your writing skills, or was it a limiting factor? It was certainly limiting. John Kalodner has a bigger ego than any other person I’ve ever worked with. Bands like AC/DC won’t even allow him in the same room as the band, and yet he took credit for A&R in their records because they had this in their contract. John Kalodner forgets why an artist was signed in the first place and thinks that just bringing in a big name producer like Bob Rock will make a difference. But what’s really important is to let the artists do what they do. Would you agree that these days the record companies have less of an influence on the success or failure of a band? Absolutely! Artists now have to know their sound, songs, and vision and know how to bring it to life. The days of a record company finding an act and nurturing and developing them are over. Now they just wait until something comes across their desk that they think is really exciting. They want to know if the band has a social media presence if they know who their fanbase is and how to get to that fanbase, how to create visuals, graphic etc. They don’t have the time or money to do it anymore, so they let the cream rise to the top and then they look for what might work. What are the plans to tour in promotion of “Eight”? I found a few dates in Europe in your touring schedule, but not so many in North America. We don’t really know yet. We’re certainly going to Europe because the response to the record has been great, and the demand for it is on the rise. We’re trying to put together some packages with bands that we’re friends with like Junkyard, Circus of Power etc. Touring in North America is kinda difficult because the cities are so spread out, and logistically it’s complicated and expensive. For us, it’s easier to go to Europe and the U.K. Easier to get around and to do business, and that’s always been the case. But the record comes out in a few days, so let’s see if the response is enough to get us on tour in the US. One last question I have is about Manic Eden, a short-lived band you put together with Adrian Vandenberg. Why didn’t you guys carry on? That was a great project, we also had Rudy Sarzo on bass and Tommy Aldridge on drums, and it was amazing working with those guys. Great people and phenomenal players! They had an idea to do this progressive bluesy kind of project. Originally it was going to be with James Christian from House of Lords, and it just wasn’t working the way they wanted it to, so they made a change in direction and called me. I listened to the songs and they were great, there were some melodies and lyrics that needed to be finished, which we did. We released the record through a Japanese label, and at the time it was quite frustrating because all the Seattle stuff was going on. We were having trouble to get people to listen to us because they were all just looking for grunge bands. And while we were trying to get all that together, Adrian went back to working with David Coverdale, and everybody had to get up and pay their bills, and it just kinda fell apart. You touched on the grunge wave, but for a lot of people, it was more like a tsunami, because it ruined a lot of bands people liked at the time. Have you come to terms with what happened then and accepted how it came about? And then Creed and Nicklelback happened, right? Yeah (laughs), at that point the system started to eat itself (laughs). I’m glad that we got to a point in this industry where Little Caesar can be heard again, and I’m looking forward to the new album. Thank you for that. We always try to make straight ahead rock and roll. And we always thought that people will find us a group of musicians that not necessarily try to break new ground or innovate. We do what we do, dedicatedly and honestly and hope that it reaches people’s ears. Thank you for your time today, Ron, and all the best to you and the band with the new release!